In this section, you will verify that Eclipse is properly set up for Java development. You are starting with a new Eclipse installation with default settings. You are familiar with the basic Eclipse workbench mechanisms, such as views and perspectives. If you're not familiar with the basic workbench mechanisms, please see the Getting Started chapter of the Workbench User Guide. If you still see the Eclipse Welcome page, click the arrow icon to begin using Eclipse. 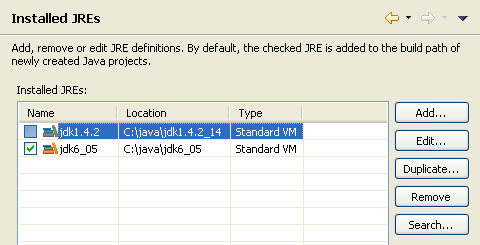 Select the Java > Installed JREs preference page to display the installed Java Runtime Environments. Confirm that a JRE has been detected. By default, the JRE used to run the workbench will be used to build and run Java programs. It should appear with a checkmark in the list of installed JREs. We recommend that you use a Java SDK instead of a JRE. An SDK is designed for development and contains the source code for the Java library, easing debugging. Additional SDKs can be added by searching the hard drive for installed SDKs. To do so, simply click the Search... button and specify a root folder for the search. If you work with code that does not yet use generics (as we do in this tutorial), we recommend that you install a Java SDK 1.4 as well, but leave the most recent version checked as default. Select the General > Workspace preference page. Confirm that the Build automatically option is checked. Select the Java > Build Path preference page. Confirm that Source and output folder is set to Folders. Select the Java > Editor preference page. Confirm that option Report problems as you type is checked. Select the Java > Compiler preference page. Confirm that option Compiler compliance level matches your default JRE version (usually 1.6).